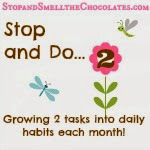 Stop and Smell the Chocolates: Pumpkin Potpourri Week ~ Would you like chocolate with that? Or pumpkin? 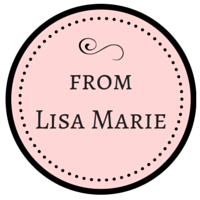 Pumpkin Potpourri Week ~ Would you like chocolate with that? 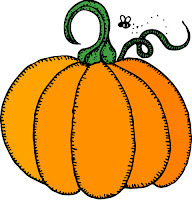 Or pumpkin? On my blog, I have chocolate posts every Friday which you are able to link up to with your own chocolate posts. I just had to combine the pumpkin and the chocolate...HAD TO! But I didn't have a recipe with pumpkin and chocolate combined. Sure, I could have added chocolate chunks to my pumpkin bread or mini chocolate chips to my pumpkin pudding or drizzled chocolate over the top of my pumpkin dessert - but I thought that would be cheating. So, I did something that I have NEVER done...I attempted to create one myself! Crazy, I know! I started with a box cake mix and a can of frosting to make it easy on myself and easier for you when you make it ('cause you know you want to try it and see how you can tweak it). I added pumpkin and spices and I'm happy with the result - a warm, mellow flavor added to the chocolate - though you should know that it's my first attempt. Maybe you could do it even better! I was going to make it a 2-layer cake, but the layers seemed a little heavy with the pumpkin, so I left it a single layer with frosting on the top (that way you have 2 - LOL!). 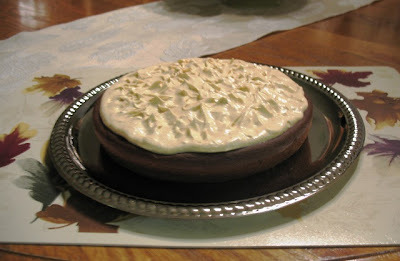 Afterward, I thought of a fun way to serve it - make the cake in pie pans and frost the top. I also think this would make fabulous cupcakes. Follow directions on box for chocolate cake, then stir in 1 can pumpkin (except for 1-1/2 tablespoons) and following 5 spices. Pour into greased pans and bake according to box directions. Remove from oven and cool completely. In medium bowl, mix whipped cream cheese frosting, pumpkin and 2 remaining spices. Frost cake(s) as desired. You could certainly do this from scratch using your favorite chocolate cake recipe and cream cheese frosting recipe and just make the pumpkin and spice additions. If you like chocolate and like pumpkin, I think you'll like this. If you try it, please let me know what you think! Now it's your turn to share! 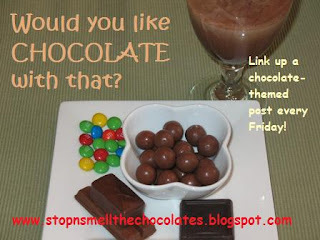 Today, you can link up any family-friendly chocolate-themed post with Mr. Linky (See last Friday for chocolate ideas). And you can link up your pumpkin-themed posts! If you're really brave, combine the two! 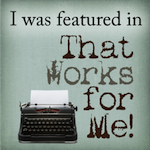 If you don't have a blog, you can leave your recipes or ideas in the comments. It's not too late to get entered in the giveaways! Go back and make a comment on each day's post if you haven't already to get all your entries for the Commenters' giveaway. Link up recipes or ideas on Wednesday's post or today's post to be entered in the Linkers' giveaway. And if you have promoted Pumpkin Potpourri Week, be sure to let me know about it so you can be entered in the Promoters' giveaway! You have plenty of time to come back and do it all - the giveaways are open until Sunday night, 9/28. 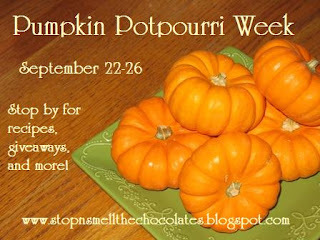 Thank you all for making Pumpkin Potpourri Week so much fun and such a big hit! Have a fun and blessed Fall weekend! You are getting creative lol. My recipe doesn't have any pumpkin in it but it sure is good. This has been a fun week. I'm hoping to win something lol!!!!!! The cake looks nice and easy to make. I like that! We could even decorate it with orange frosting and make it look like a pumpkin or jack-o-lantern! this is such fun! i'm sad that i just found it today!!! any chance of an extension? lol! thank you for coming up with such a great idea!!! There's that Kim in first place again!!!! Hi Kim! Glad to see you get up so early and RUN right over here to check Lisa out first thing in the morning, before the crack of dawn!!!! Anyway, Lisa, sounds as if you were very creative with your chocolate and pumpkin. Now did I miss read your posting?? Did you actually taste your creation? How did you rate it on a scale of 1 to 10. And did you feed it to the family? I have loved your week and think you did a GREAT JOB with it. Congratulations, job well done. I would never give you anything that I hadn't tasted and enjoyed! I made 2 mini cakes with the batter and tried frosting mixtures until I was happy. I was going to only eat part of my "sample", but gobbled the whole thing up and my hubby had his for breakfast and liked it. Hard for me to rate (somewhere in the 8-9 range)- I really like it, but it's different than a straight chocolate cake or something pumpkin. The cake is less sweet and has a subtle spice. And the frosting has a nice creamy spice that adds just the right amount of sweetness. Also, hard to see in the picture - the frosting is a pale orange from the added pumpkin and has specks of cinnamon and nutmeg visible. It looks pretty with the chocolate cake. I am so glad I can go back and comment! I was afraid if I snoozed, I losed! Anyway, I would like to try your cake, will you make it for the banquet????? Please!!??? Very creative and daring of you.